Mon., July 16, 2018, 8:27 a.m.
A GRIP ON SPORTS • Momentum is the most mercurial entity in sports, especially professional sports. And yet it’s hard to prove it even exists. Read on. • As far as I can discover, there are no analytics that document momentum, either positive or negative, in the human condition. In nature, in physics, sure. Isaac Newton figured that one out. But in our day-to-day lives, or from our favorite sports team’s moment-by-moment existence, there is no way to prove momentum plays a part. As I’m not a physicist or a psychiatrist, I won’t even try. And yet, like a bunch of lemmings, we believe. At least most of us. Score a goal early and all the “momentum” is in your favor. Lose a few games and “momentum” will make it hard to pull out of the slide. Which brings us to the Seattle Mariners. In June, the M’s were riding the crest of the most positive momentum this side of Disney World. Now it’s mid-July. And that upward momentum is gone, replaced by the free-fall of eight losses in their last 11 games. If you are one of those momentum-deniers, then you cite Earl Weaver’s famous line equating the condition to the next day’s starting pitcher. But what if the one pitcher on your staff seemingly capable of changing the momentum back in your favor is on the disabled list? That’s what’s been happening to the M’s recently. The starting pitching, heck just the pitching, has slipped while the offense is spinning its wheels a bit. Which leads to a three-game sweep in Colorado. And an all-star break that is not just welcomed but needed. If momentum really does exist, a four-day stretch without games has to put a real dent in it, right? After all, James Paxton, who we alluded to above, is expected to return from the DL just after it, as is Felix Hernandez. That should help with the starting pitching part. The four days also allows the bullpen to rest and recuperate. The guys need it. With all the tight games the Mariners have played – 38 of their games have been decided by one run, as many as any team in baseball – just about every pitch relievers have thrown has been under stress. It didn’t help this weekend that Nelson Cruz, their most accomplished hitter, wasn’t in the lineup. Luckily, they won’t play in National League ballpark again until late August. By then Robinson Cano will be back and the offense could be back on track. They may be 58-39 but thanks to their four-game losing streak they have actually scored two less runs (412) than they have given up (414) this season. And then there is Oakland. The A’s have cut the M’s lead for the second wild-card spot to three games. If it comes down to head-to-head games between the two, they play 10 times the rest of the way. Seven of those are in Oakland. Momentum? If it does exist, it’s in the A’s favor. They are 21-9 in their last 30 games, picking up six games on Seattle in that time frame. So enjoy the next few days without competitive baseball games. Under the laws of baseball momentum, the inertia provided should brake the M’s downward slide. WSU: So, I wasn’t sure where to put Jim Meehan’s coverage of the Rosauers Open Invitational. Should I make a golf section, as it is a golf tournament? Or should I put it in the Washington State section, as the victor is a Cougar alum? I decided to put Jim’s story on Derek Bayley’s second Rosauers title here. … Around the Pac-12, Colorado is looking for improvement on the defensive line. Indians: The homestand ended with another great pitching performance and a 7-2 win over Eugene. Dave Nichols chronicles the happenings in this story. … Elsewhere in the Northwest League, Everett railed for a win over visiting Salem-Keiser. 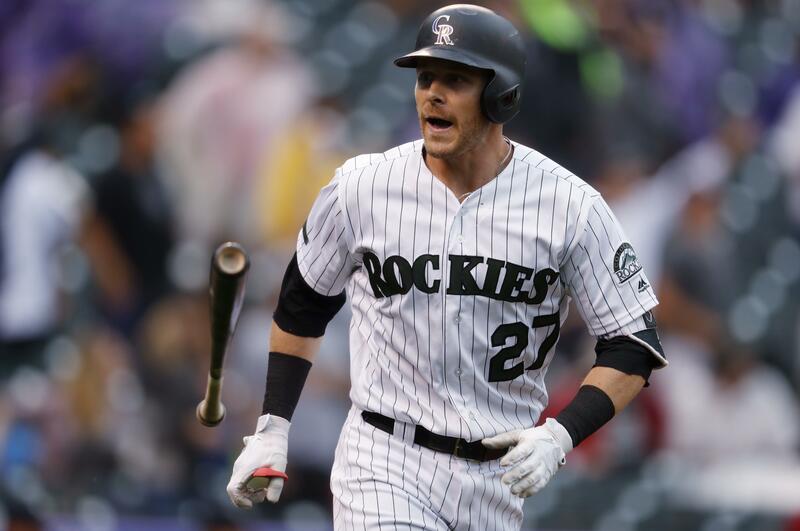 Mariners: The latest loss was of the walk-off variety, with Trevor Story's solo home run off Nick Vincent lifting Colorado to a 4-3 victory. … There are four Mariner players headed to Washington, D.C, for the All-Star Game, including Mitch Haninger. … Kyle Lewis played in the Futures Game and said he's feeling 100 percent. Sounders: A crowd of more than 70,000 screaming against you. Playing a man short down the stretch. And yet the Sounders, thanks in large part to Stefan Frei, held on for a 1-1 draw in Atlanta. … Portland also picked up a point with a draw in Los Angeles. Published: July 16, 2018, 8:27 a.m.